Windows 7 and 8.1, Server 2008 R2 and Server 2012 R2 users and admins who have already installed the patches Microsoft released today for those operating system may have noticed that the updates included a patch that added a Diagnostics Tracking Service service to the operating system. Windows 10 users may know the service already as it has been part of the operating system for some time. The support article that Microsoft has created for the patch reveals little information about the actual purpose of the service. This update enables the Diagnostics Tracking Service in Windows 8.1, Windows Server 2012 R2, Windows 7 Service Pack 1 (SP1), and Windows Server 2008 R2 SP1. This tracking service collects data about functional issues in Windows. The description reveals no information about the purpose other than that it is collecting data about functional issues and sending those information to Microsoft. The patch has been released for Windows 7 with Service Pack 1, Windows Server 2008 R2 with Service Pack 1, Windows 8.1 and Windows Server 2012 R2. Basically, for the majority of supported versions of Windows with the exception of Windows Vista, Windows Server 2003 and Windows RT. The service does not appear to be a critical system service that needs to run at all. Considering that it was just added, it is fair to say that disabling it may not affect the underlying system or at the very most only marginally. The service is not protected in any way which means that you can disable it using the Services manager. Tap on the Windows-key, type services and hit enter. Activate the startup type menu and select disabled from it. This disables the services' autostart. Click the stop button afterwards to stop the running process. This stops the service for the current session. The service won't start with Windows anymore and won't run in the session you have disabled it. To enable the service again, repeat the steps but set its startup type to automatic and click on start afterwards to start it for the active session. Windows users may have several issues with the tracking service. First, it was added via automatic updates and set to run by default on user systems it was installed on. Second, the description is vague and Microsoft reveals no additional details about the service's function on the support website. No information about the collected data is revealed by Microsoft at this point in time which makes this worrying especially for privacy-conscious users. Update: Installation of the patch may cause sys file corruption on Windows. Additional information about that are available here. 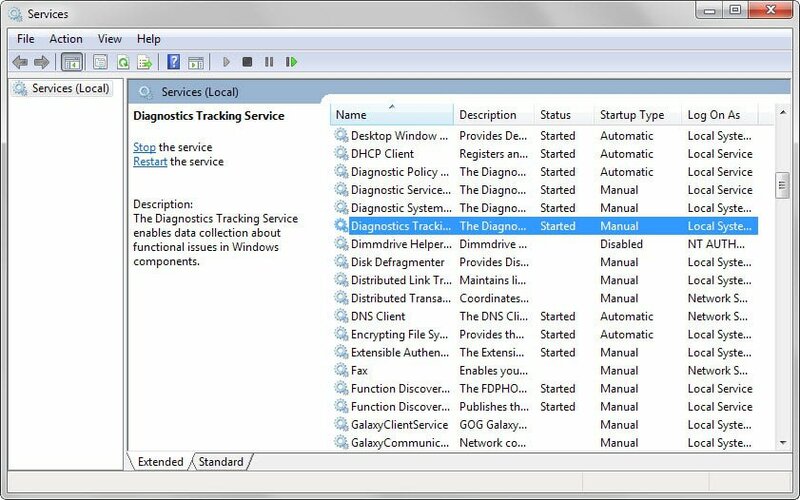 Find out how to disable the Diagnostics Tracking Service that Microsoft pushed to various operating systems via the May 2015 Patch Day. Previous Post: « What is wsappx and why is it causing high cpu load? Good stuff. Disabled it as soon as saw it. Service not just disabled, but removed completely. I have some doubts, albeit unfounded ones, that even with services disabled, info is being sent. Is that even possible? Please don’t feed my natural paranoia! but when I opened Services by way of the Task Manager’s “Service Tab”… I found the Diagnostic Tracking service, selected properties and put a stop to it. The second line is just the output when you run the first line; no need to type it. I removed the space between Diag Track and I got a success prompt. For us newbies, would you be so kind as to do a step-by-step procedure? I don’t even know how to get to “cmd prompt”. I went through “Windows 7 The Definitive Guide” but did not see any references to it. Tap on the Windows-key to open the Start Menu. Type cmd.exe, right-click the result and select run as administrator. When the command prompt opens, run the commands. I keep reading about people who say to press the Windows key to bring up the command prompt (as in good old fashioned DOS). I am running Win 8.1 and this does not work on my computer. If you are using a mouse, try right-clicking on the start button (at the lower left portion of your screen, and you might have to hold it there for a second or two until Windows figures out what you are trying to do) and then select ‘Command Prompt (Admin)’. From there you will be able to follow whichever of the conflicting posts that were left above, but at least you’ll be in the ballpark. This reminds me of the story of a man who had been stranded in a cave for so long that he went blind. When rescuers came to his aid they simply said “Turn left at the first tunnel, and then go straight ahead until you can see the light.” The man was BLIND! Blind people need to be led to the light. They cannot find it on their own. I have Windows 8 from 2013. I tried doing the command prompts as admin. (and as user, but that didn’t work). Like “BLUE” I got a FAILED message. An other reason for everyone, non-techies included, to read technical blogs, and moreover when the rhetoric, free of high-high lashes macro-thoughts allows a simple user to understand and handle computer related “stuff” easily, as it is proposed here on gHacks. I’m just trying to imagine the number (the percentage) of users who will continue to run this Diagnostics Tracking Service when it is not required for their system and, maybe, not advised for their privacy. Incidentally I note that the order for changing a Windows Service is 1- Modify the start-up type and, 2- Start or Stop the Service. I sometimes reverse the order when logic should impose itself to me. Stopping a service and then disabling normally works just fine; but a select few services will end up restarting in the few seconds it takes to stop / disable. Nothing exciting really as even if you don’t catch it, the next reboot all is good. That’s odd. I don’t have this service running. Win 8.1 64-bit. Did all the updates and restarted. I saw this update yesterday, even before Patch Tuesday. I decided if M$ wants to be vague then I’m not going to install it. Right-click→Hide and good riddance. Hmm, in Win7 I’m not seeing a “hide” option. You’re referring to the Windows Update interface, right? The interesting part I think is that the update was available, at least on Windows 7, for a while as an optional update but now it is available as an important update. Microsoft… What are you doing! Check to see if your system has that “gwx” directory. If you choose to uninstall the related kb, as far as I can tell, it does uninstall cleanly. I thank you for the heads up, Mr. Brinkmann! I just looked at the list of new Microsoft Windows Updates and did NOT install the Diagnostic Tracking Service! As there are more than 100 hidden services cropping personal data and sending that data 24/7 to Microsoft, what’s the problem adding another one ? If it’s another service that isn’t really needed then why add it at all? If it’s useful, say what it does and describe the impact it has on resources and privacy. Some services turn out to be stupid, like Tablet PC was on Vista machines. There was no reason to set it to Automatic start by default when Manual would have made more sense as the start up type. On Windows 7 this was corrected. Sometimes, it seems, Microsoft just shoves things down our throats to see what we’ll tolerate. We fear what we do not understand, eh? A plausible (speculative) reason that this particular service is set to automatic start: it doesn’t consume resources. It just registers a hook, a listener. For instance, in addition to certain events generating an event log entry, the hook would, conditionally, also queue a DTS event item. The KB3022345 that installs the Diagnostics Tracking Service update appeared on Windows update last week for me, needless to say like all the updates that Microsoft have been issuing to get my PC ready for Window 10 it didn’t get installed and remains hidden. I do wish Microsoft would stop issuing updates intended to ease the upgrade process to Windows 10, if i want to upgrade I’ll do it when I’m good and ready, I don’t need or want diagnostics, advertising, or data being sent to Microsoft about how ready my PC is for something that may never happen. Man, am I ever in agreement with you. I bought a new car a little more than a year ago, and it is the most dangerous vehicle I have ever ridden in. As soon as you turn the key, all the doors lock and they remain locked until you put the vehicle into park and pull the key out of the ignition switch. Six people perished in such a vehicle just a few days ago after a semi-truck slammed into their SUV, pushed them off the road and ruptured their fuel tank. When the cops arrived, there was nothing they could do because the doors were all locked and flames were shooting out in all directions. MS keeps trying to ram stuff down our throats, and I do not like it. If I want my doors locked, I will lock my doors myself. If I want to update my OS, I’ll update my OS. If I want to abandon MS, I’ll abandon MS. Linux looks like the best place to go, and I will never buy another PC that is preloaded with the tons of crap that MS always bundles with their operating systems. Goodbye, Microsoft. I am heading elsewhere. My last post seems to be caught up in ‘moderation’. Maybe this one will make it through? What is there to moderate? I am speaking the truth as truthfully as I know how to speak it. Thanks for the tip. After rebooting, it stayed disabled. My laptop is running Windows 8.1 Pro If I start to have performance issues, I’ll set the Diagnostics Tracking Service back to Automatic. If it’s just for diagnostic purposes, they should have called it “Diagnostics Service”. Adding the word “tracking” makes it sound like another Big Brother piece of software that many of us don’t want recording and analyzing what we do. Can’t we just uninstall this update ? Is there a way to delete the actual update once installed!? Unfortunately, I have automatic updates set on win8.1. I noticed microsoft management console is also running! i stopped service and it continued. Under “diagnostic tacking service” Along with disabling it I also went to recovery tab and set all options to “Take no action”. Should this be efficient for stopping all services from running with the diagnostic tracking service? or will there be a hidden process? If so, How could i remove it completely from my system? thank you in advanced! I just disable it in the services area and immediately got a message that MpIdleTask wanted to be added my startup programs. Does this have anything to do with disabling this service? Verfy strange!!! Could this be one of those backdoors for the N.S.A. Funny Microsoft has nothing to say. Nothing to say because… it’s too complicated, we wouldn’t understand. Lol. Plenty of professional IT here. We’d understand just fine bro. “Tap on the Windows-key, type services and hit enter.” The first thing that comes up (and would be selected) on Windows 7 Home Premium SP1 is “Component Services.” Have to hit Down then Enter. Since turning this off yesterday, I figured it was a good thing to not let them have more control than they should. But last night I crashed for no apparent reason and then it dawned on me what stopping that service is a part of. When window’s crashes, this service is part of their report/track system for a solution for our reason for crashing. The files it generates is required by this service and disabling it leaves the pop-up discovery box hanging til we close it. Turning it back on found a solution to my problem and it FIXED it… So for me, I turned it back on. They got me with the previous iteration of this, but they didn’t get me with this one. Microsoft has compiled a track record of questionable and just plain buggy pre-selected Windows Update updates over the past several months. I’ve disabled automatic updating and plan to just check manually from time to time, carefully reviewing anything that looks fishy, and certainly anything that’s not a security update. For whatever reason, I can no longer access KB articles from any browser, so I have to find info on mystery patches from third parties. If anyone knows a fix, I’m all ears! I just discovered this update today and this update was installed back on May 8 on my PC. damn. How to disable this service. How to delete this service. It appears Microsoft are aware of the concerns about this “service” and have put the same thing into Windows 10 but have sneakily renamed it “Connected User Experiences and Telemetry Service”. I have Window 7 and just noticed that diagnostic tracking service came up when I shutting down’ and it stated “waiting for Diagnostic Tracking Service to shut down” I’m using Google a web browser. I having problem loading down URL sits now. 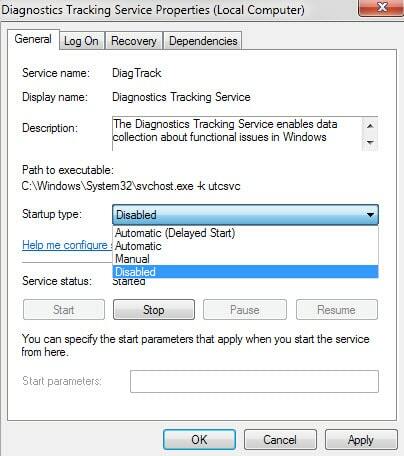 Just like your sit ghacks/net/2015/05/12/how-to-disable-diagnostics-tracking service-in-windows/. I have been on your URL sit for 25 minutes. and upper left corner the folder tab still has the blue circle continuing clockwise and hasn’t finished. I have page loading time icon and has load yet, and the blue circle hasn’t stopped yet–I don’t think it will stop. I having problems just loading any site from google. I disable diagnostic tracking service through “search” and typed in service” but they are other diagnostic downloads on the service site? The descriptions on what each sits will do but it very vague in Microsoft description. I think that Microsoft has my computer downloaded with crap, it won’t function like it should! I remember here about 6 weeks ago one night around 12:00 pm. The computer started to shut down then the screen had a pop-up “do not turn the computer off you have 64 downloads”. I left the computer on all night. How do I speed up this HP Omni 100 PC with Window 7? I read on a forum that there are actually 4 different instances of this service but I only found one. I am still waiting for a reply to know for sure on what they’re talking about but maybe someone here could enlighten me instead. They mean four different states: security, basic, enhanced and full.